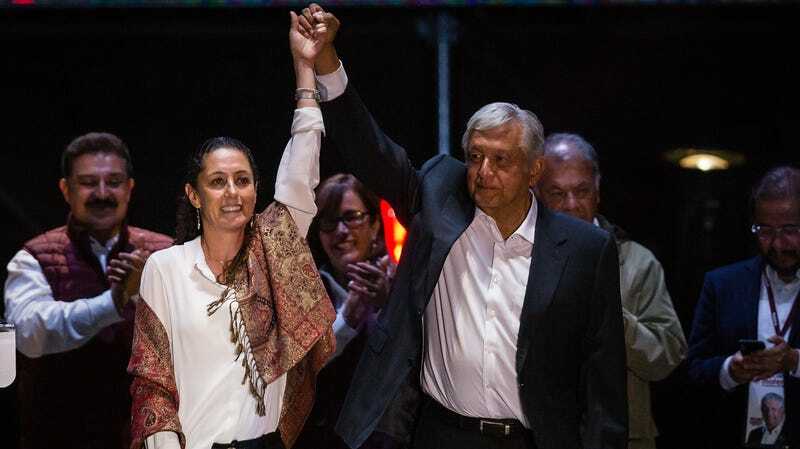 Claudia Sheinbaum, left, with presidential winner Andres Manuel Lopez Obrador. Scientist Claudia Sheinbaum will be elected mayor of Mexico City, according to exit polls from Sunday’s local and national elections in Mexico. Sheinbaum will be the first woman elected mayor of Mexico’s capital and the most populous city in North America. She will also be Mexico City’s first Jewish mayor. According to Agence-France Presse, exit polls show Sheinbaum, 56, won between 47.5 and 55.5 percent of the vote on Sunday. Sheinbaum, a scientist and environmentalist, was considered the frontrunner, having run alongside Andres Manuel Lopez Obrador, who won the presidency in a landslide. Sheinbaum, a noted left-wing activist, joined AMLO’s leftist breakaway party, Morena, in 2014. Sheinbaum will not be the first woman to lead Mexico City—that distinction belongs to Rosario Robles, who served as a substitute mayor from 1999 to 2000 when her predecessor, Cuauhtémoc Cárdenas, resigned to run for president. But she is the first woman chosen by the people. Though Mexico’s elections have long skewed in favor of men, more than 3,000 women ran in local and national elections this year, prompting Mexicans to call it “el año de la mujer” (the year of the woman), according to NPR.